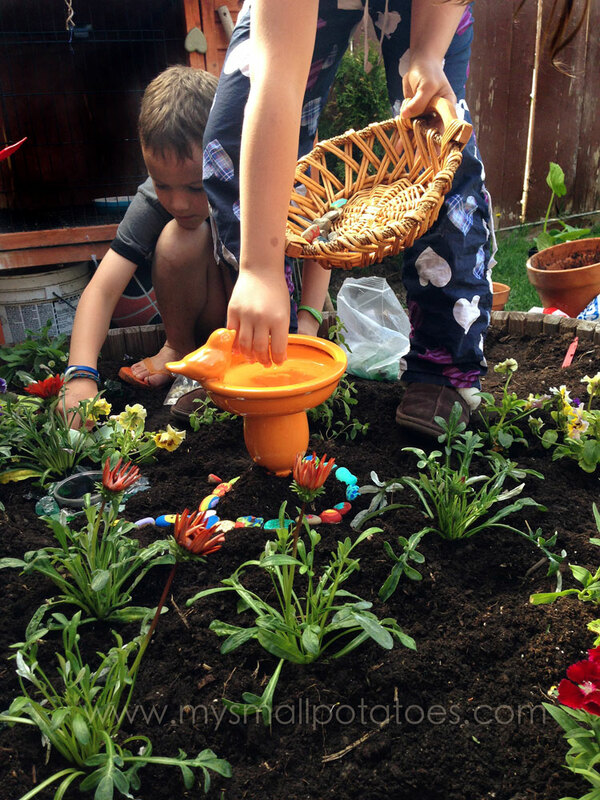 Around this time last year, my two littlest children and I built a little garden in the backyard…just for them to play in. The flowers grew, and the bees buzzed in and out. The children drove trucks through the little muddy pathways, they dug up worms, ate the strawberries from their own tiny patch, and watched the sweet peas climb the back wall. There were some very special hours passed in that little garden. But something always seemed to be missing. 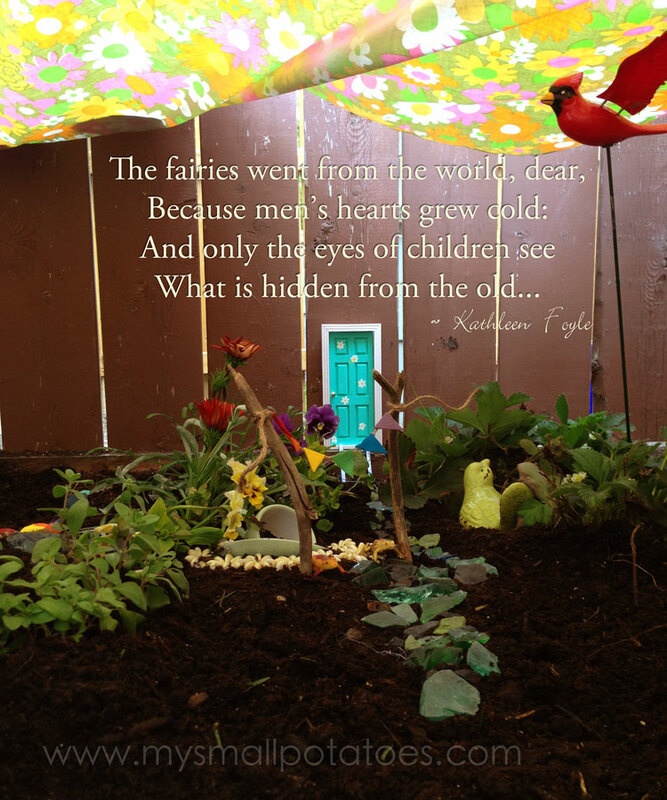 My 2 little ones firmly believe in the magic of fairies, and I am not one to argue about things of the heart…I am a huge believer in things one cannot always see. 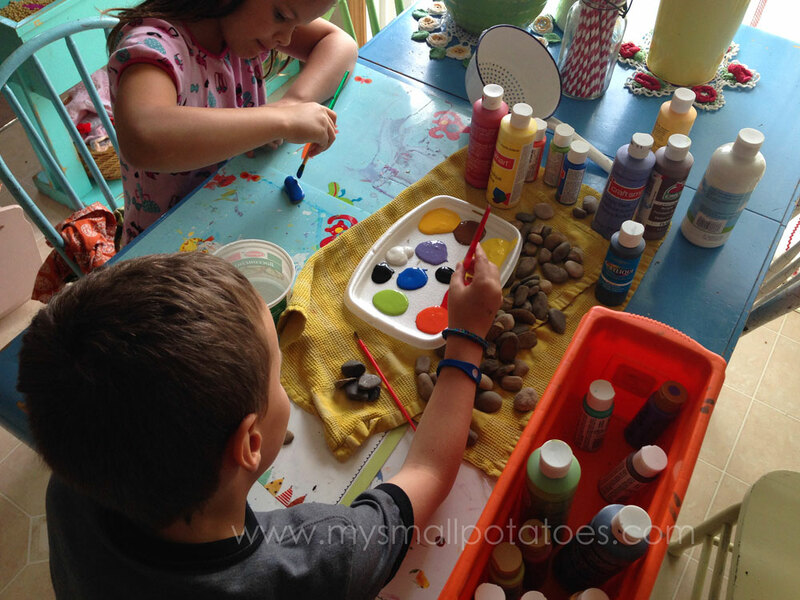 So Coco, age 9, and Mr. Pancakes, age 7 went about planning their garden. They wanted it to be everything it needed to be for fairies to want to come and visit, and I wanted it not to cost me a fortune. 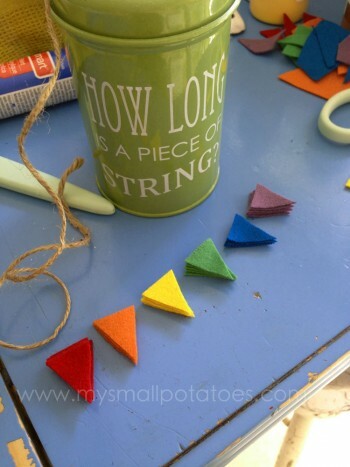 We put our minds together, scrounged things from the craft room, visited our favourite thrift store, and gathered up a few things from our backyard. 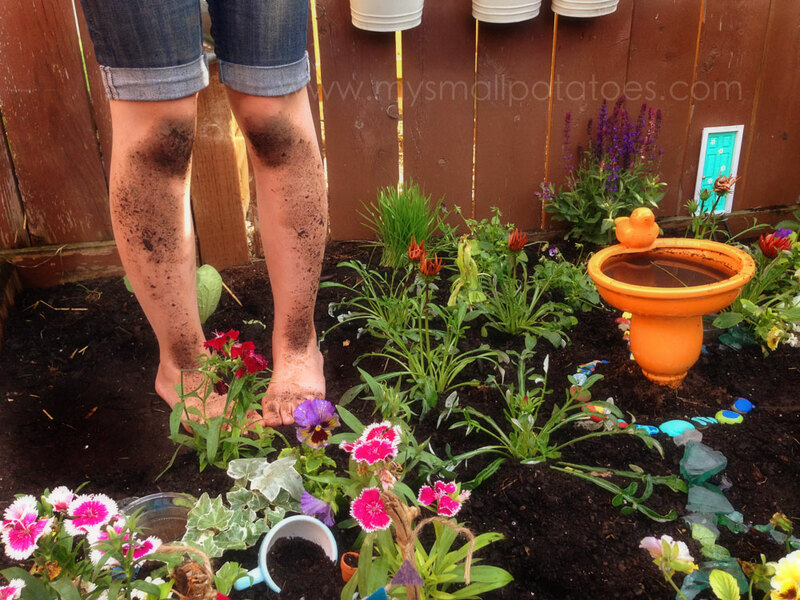 We also tried to use most of the bits we had already put in our garden last summer. *Some of the other bits and pieces we collected for the garden were seashells, twigs, stones, $1 tea cups and saucers, 50 cent glass bowls and a $3 bag of sea glass from the thrift store, little terra-cotta pots from the Dollar Store, plastic frogs, a ceramic bird, a plastic flying cardinal on a stake, and bird bath from last year’s garden. We took a trip to the Farmer’s Market and Coco and Mr. P. chose all kids of flowers and herbs to plant. The strawberry patch had already come back up in the existing garden, so that was a big bonus! Everything was coming together so swimmingly. This is Iris. She lives here in Mr. P’s teacup house. Mr. Pancakes says she uses her magic to bring honeybees to the garden and to make the spiders stay out. This is Ivy. The kids tell me she is responsible for making all the herbs bright green and very tasty! And this is Bluebell. She lives in Coco’s teacup house and is a little bit shy of cameras. Coco says she likes to sing for the other fairies and birds nearby. The two kids have been playing in that little garden every chance they get. 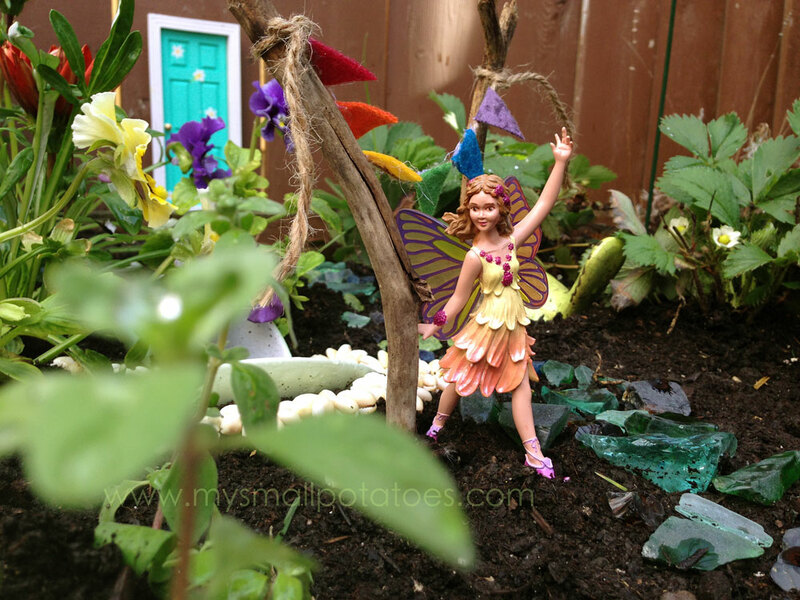 Each day they check to see if anything has moved about in their garden…proof that other fairies are using their little door into this magical little place. They come inside with dirty knees, happy hearts, and full of tales to tell. This garden was designed and built almost entirely by my kids. 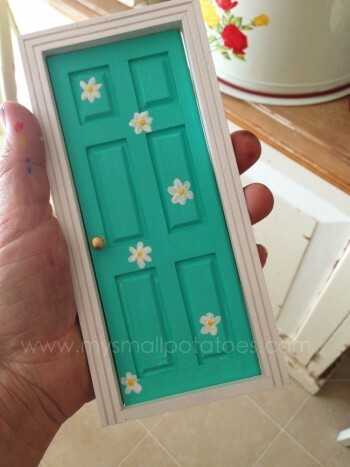 I painted the door and installed it, and I made the fairy buntings. That’s it. I let them choose the flowers and herbs and decide where they should be planted. *The plants in their garden include strawberries, pansies, dianthus, wheatgrass (for their smoothies), parsley and cilantro for the hens, a pumpkin for jack-o-laterns in the fall, ivy, thyme for “fairy carpets”, peppermint for their fruit drinks in the summer, and a few other perennials of which I have forgotten the names of. The only direction I gave was to choose plants that were easily maintained and required the kind of sunshine that we get on that side of the yard. 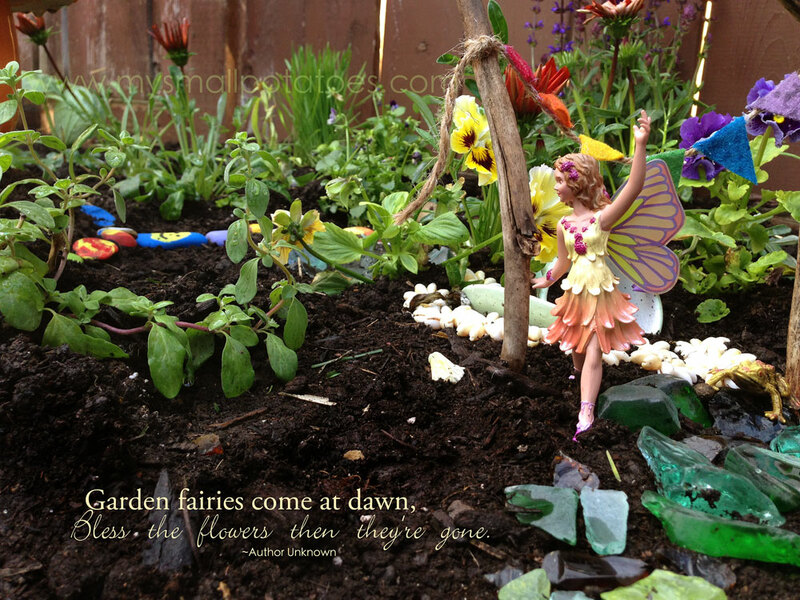 The bits and pieces they built their fairy garden with, were also their own ideas, and they cost next to nothing, making this a project that didn’t wear me out, nor empty my bank account. I like that kind of project, don’t you? And I like fairies, too. p.s. The fairies are made by Safari Ltd. and were purchased at Michaels, but you can buy them online at Amazon. 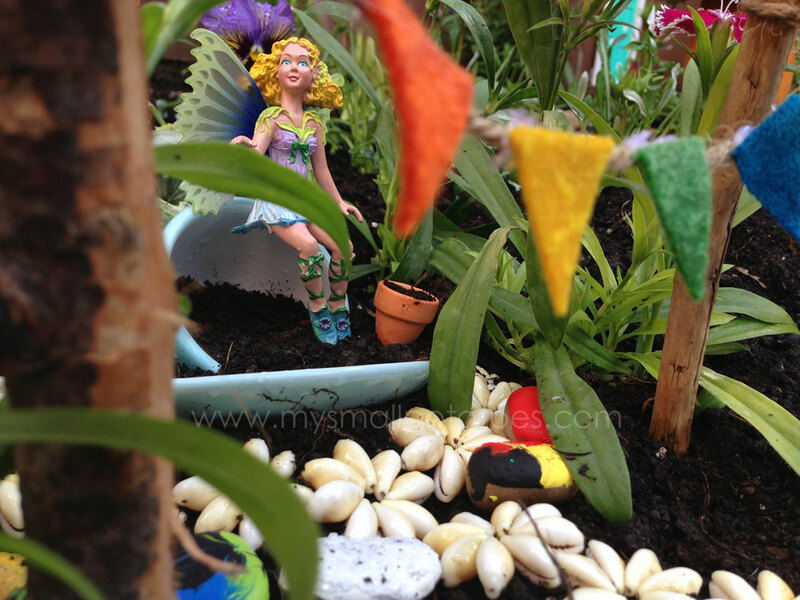 Safari Ltd. has also created a Toob of tinier fairies which can be purchased at Amazon. Oh, and THIS set is on Coco’s wish list and I can’t blame her! Your kids are right it was a miracle that we got through last winter. I lost one rose bush and replaced it with four new ones. Can’t wait to see them grow. 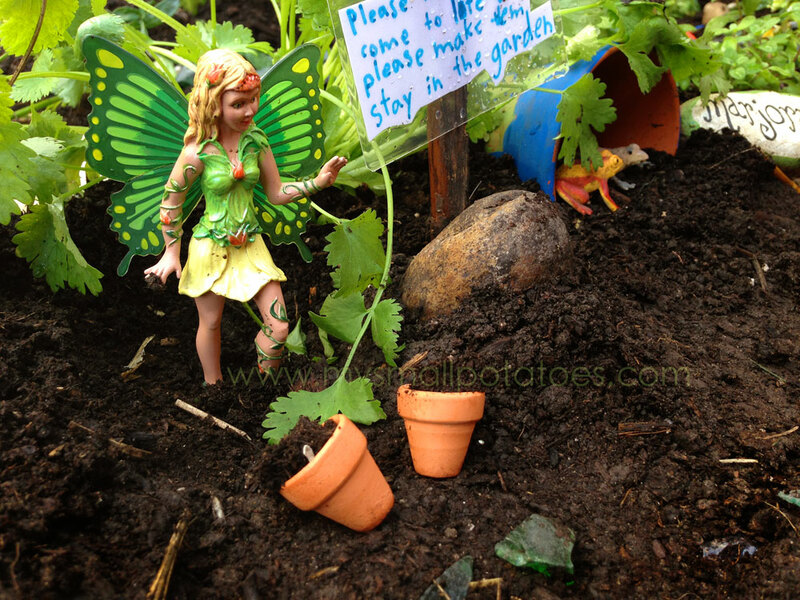 Took my nieces for a walk a few weeks ago and stumbled upon a ltitle fairy garden (not nearly as cute as yours!) the girls LOVED it. I can’t wait to try it myself. Thank you so much! We are enjoying ours very much! This is brilliant! 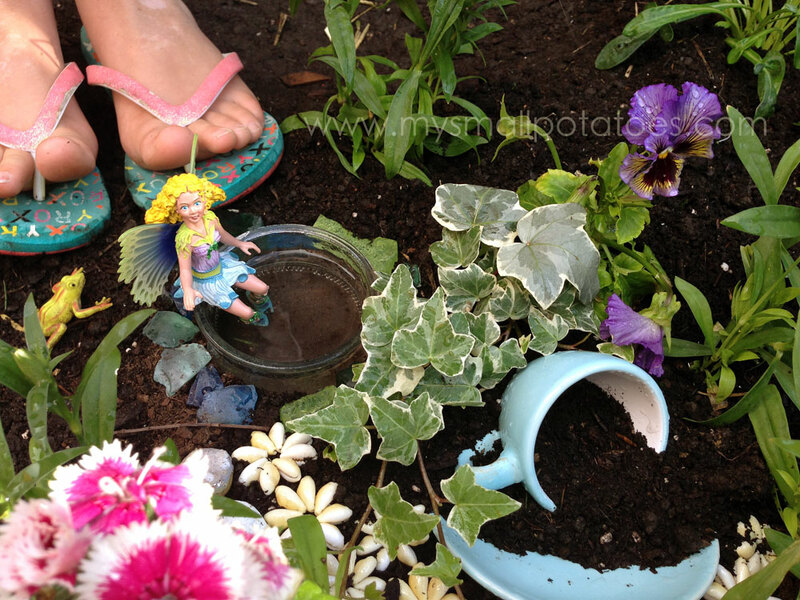 I’m just in the process of sorting my garden out and I’ll definitely be saving a little patch of dirt for my princesses to build their own fairy garden. Thanks for the great idea! This is so inspiring. 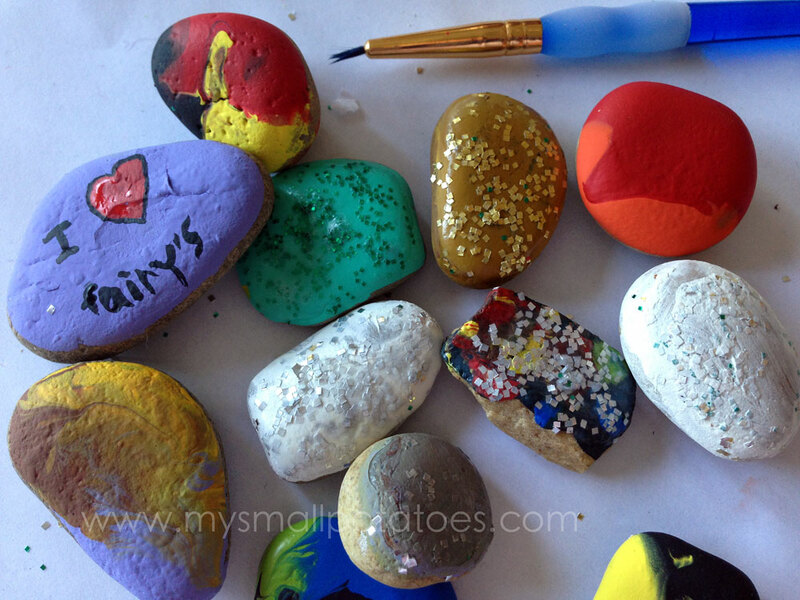 I m planning on doing something like this soon with my children. I find this very inspiring for my almost 3 year old daughter! 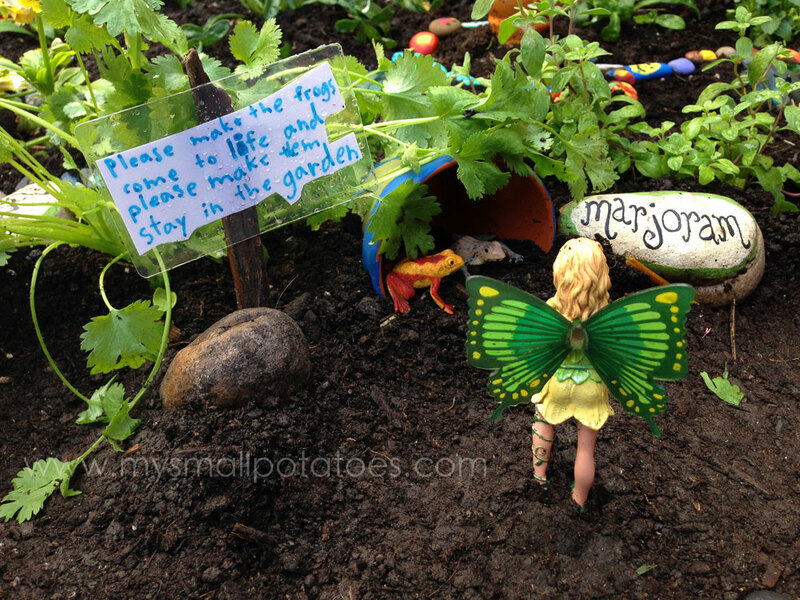 We have a vegetable garden, but she finds it a little boring, maybe fairies will make it more enjoyable for her. i love it! but for now i have a balcony so it will have to wait ! Ahhh…. everything looks so pretty – whimsical, fantastical & super cute! 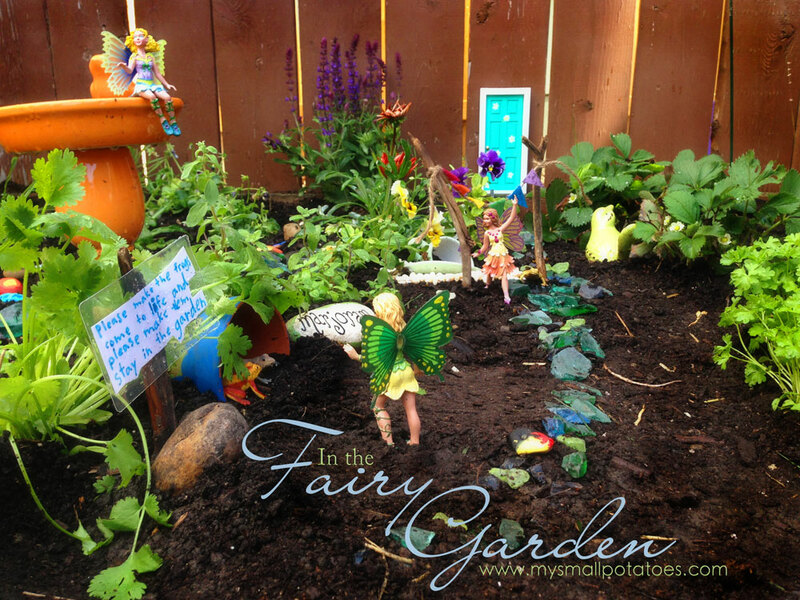 I absolutely love this idea.. the fairy garden is beautiful. Love the door, great touch! Wow! Good job kiddos! That is a great garden, so wonderfully done and so many colors!